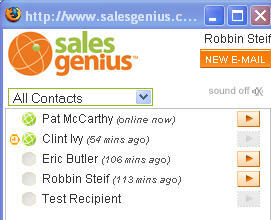 Here’s how it works: the salesperson, presumably, sends email to her prospective customer using the SalesGenius website (the Outlook plug-in is still in beta.) As part of the email, the sales rep includes a link to her own company’s website. And here’s where the phishing (and the intended value) come in. The link automatically redirects through the SalesGenius server, rsvp1, so the url comes up looking like this: http://www.mysite.rsvp1.com. 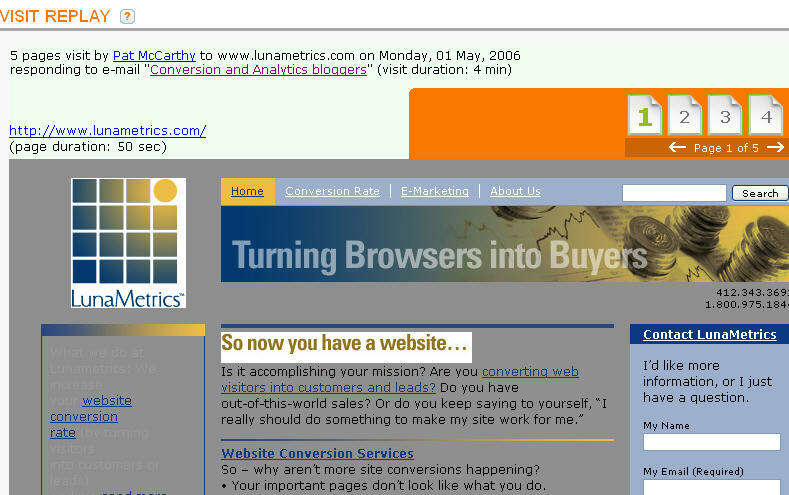 However, the unsuspecting potential customer doesn’t realize that he was redirected unless he happens to look at the address bar, because the page is the same as the one he is expecting to see. The salesperson can now get on her account at SalesGenius and see which recipient of her email clicked to the site, which pages the potential customer looked at, in what order he looked at them, and how long he stayed on each page. To test it out, I created a free 30-day account. 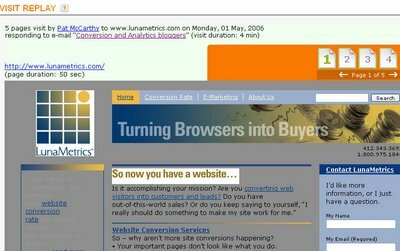 Then I sent email from my new SalesGenius account to three web analytic/conversion rate bloggers – I just told them that I was testing invasive software and asked them to click around my site, on more than one page. 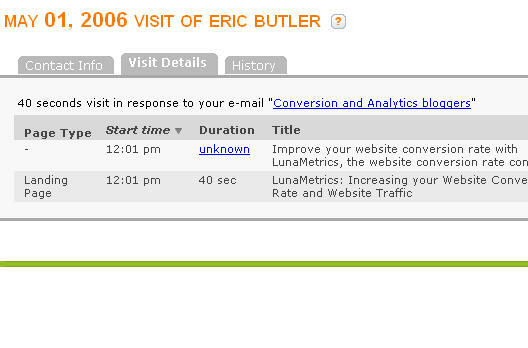 When I created the email, I was going to create a naked link, www.lunametrics.com, but the SalesGenius software encouraged me to bury my site link in a phrase, like this. 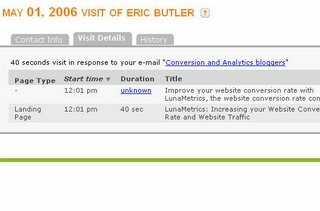 Here you can see the first screen shot, where Pat McCarthy from Conversion Rater was on the site while I was looking, Clint Ivy from Instant Cognition had opened the email but not visited the site, and Eric Butler from Inside Analytics has already been to my site. This last step seemed a little redundant, I had already seen it (albeit by page name) in the step before, but if the URL names are not very descriptive, or the clickstream was a long one (or the salesperson doesn’t know the website well) it might be helpful. You can imagine how much I disliked the deception here. Here is an excellent review on CNET, The Case of the Spying Salesman. It’s also worth looking at the very interesting comments on the TechCrunch review earlier today. Many thanks to Eric, Pat and Clint for their help.